The Lost World Caverns are located on the outskirts of Lewisburg, West Virginia. The caverns consist of one mile of interconnected passages at depths of up to 245 feet below ground. Walking tours of the caves take guests into the main 1,000-foot long chamber. At 300-feet wide and 120-feet high, the chamber offers a wealth of geological formations and waterfalls, including stalactite and stalagmite formations, many of which are named. Famous formations include the Bridal Veil, a sparkling column of white calcite. The Snowy Chandelier is presumed to be largest stalactite in the United States at over 30 tons. The War Club is a 28-foot tall stalagmite made famous in 1971 when Bob Addis sat on top of it for close to 16 days, garnering himself a spot in the Guinness Book of World Records. Wild Cave Tours take guests on an adventure beyond the Walking Tour to the more undeveloped parts of the cavern. The 4-hour tours offer over 1-mile of climbs and squeezes through tight passageways with names such as The Birth Canal, the Drain and the Squeeze Box. All equipment such as headlamps, kneepads, helmets and gloves are provided, including a light snack. Showers and hot lunches are available for those who complete the Wild Cave Tours, as they end with a muddy surprise. Guests on the Wild Cave Tour follow sterilization procedures to prevent the spread of white nose syndrome, a disease that is increasingly affecting the Appalachian bat population. The cave drains via a network of springs into the Greenbrier River in Fort Spring, nearly ten miles away. A 3,000 square foot museum and gift shop is located on site. The museum is home to West Virginia’s largest collection of fossils and dinosaur replicas. Replica fossils, geodes and minerals are available for purchase. History: The Lost World Caverns were discovered in 1942 by the Virginia Polytechnic Institute. 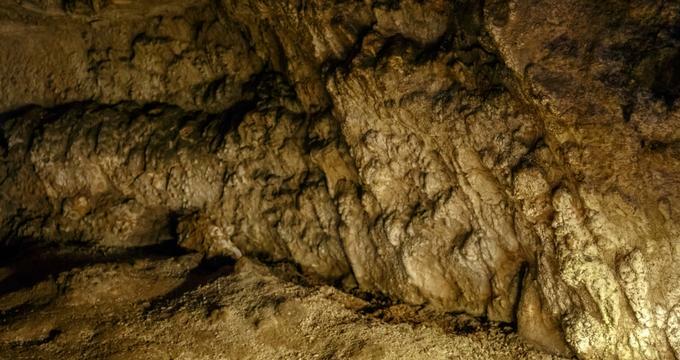 Originally known as the Grapevine Cave, they had been known for years to farmers in the region who used the cave’s single vertical entrance to dispose of deceased cattle and trash. Surveys of the caves in the 1960’s established their geography and mapped their underground passages. In 1967, the remains of a pre-historic cave bear were found in one of the underground caverns. The caves were opened for tourism in the 1970’s after the trash was cleared out and a new, cement tunnel entrance was dug out, allowing for visitors to easily walk in. The caverns were registered as a National Natural Landmark in 1973. Renovations in the 1980’s added more wooden walkways and a gift shop. Updates were made to the cave’s lighting, which was causing overgrowth of algae in the damp environment. In 1992, the site gained fame as the alleged home of Bat Boy, a tabloid-driven large-eyed wild boy who was raised by bats in a cave and survived by eating insects. The Bat Boy legend gained national fame and led to a Broadway musical. The caverns have been privately owned by Steve Silverberg since 1999. Ongoing Programs and Education: In addition to the 45-minute walking tour or the 4-hour Wild Cave Tour, self-guided cave tours are available for guests who stay on the trail through the main cavern. Visitors are given explanatory brochures to take with them on the one half mile loop. Temperatures within the cave stay at a consistent 52 degrees, regardless of the weather. Los World Caverns offers special 45-minute group tours for school groups. The tour takes students through the main cavern and spends extra time explaining how the caves were formed, how stalagmites and stalactites are formed, and what type of life has been found in the caves. Environmental groups, especially the Greenbrier River Watershed Association, have been encouraging the educational cave tours, which demonstrate the relationship between surface water and ground water. Because the caves are surrounded by farmland on all sides, they are uniquely positioned to demonstrate the effects of groundwater runoff from farmed lands. What’s Nearby: Lewisburg, West Virginia is a historic town with a nationally recognized arts and commercial district offering fine art galleries, restaurants and cafes. The town was named to National Geographic’s list of America’s Top Ten Communities. A number of Civil War battles were fought in and around Lewisburg, leading to its designation as a National Historic District. Lewisburg has also become an epicenter for outdoor recreation. Several outfitters offer whitewater rafting within the Gauley River National Recreation Area, as well as canoe trips, zip lining and horseback riding.